About 14,000 British Airways cabin crew staff had voted overwhelmingly in favor of the holiday strike. 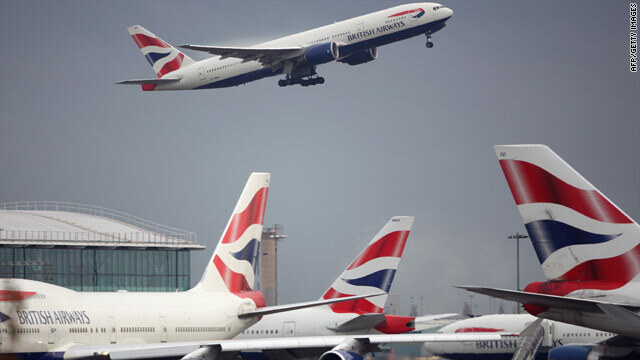 Airline issues a statement saying it is "delighted for our customers"
London, England (CNN) -- A strike that would have crippled British Airways over Christmas and New Year's Day cannot go ahead, a judge ruled Thursday. Judge Laura Cox issued an injunction blocking the planned 12-day strike, which was set to start December 22 and could have affected up to 1 million passengers. The airline immediately issued a statement saying it is "delighted for our customers. "There was never any need for a strike and we hope that Unite will take this opportunity to reflect before deciding its next steps," BA said, referring to the union that planned the strike. "Our customers do not believe that old-style trade union militancy is relevant to our efforts to move British Airways back toward profitability." But Unite joint general secretaries Derek Simpson and Tony Woodley called it "a disgraceful day for democracy when a court can overrule such an overwhelming decision by employees taken in a secret ballot. "This dispute is not settled. Passing the buck to the courts to do management's job for them was never going to be the answer," they said, warning they could vote again to strike. "BA must accept that there can be no resolution except through negotiation, failing which there will inevitably be a further ballot for industrial action." Unite has been engaged in a bitter dispute with British Airways management. "I'm not disappointed for the people that can get away at Christmas," Simpson told CNN. "It was never our desire to hurt those people. What we wanted to do was force a negotiated settlement." He said he is concerned the decision has "hardened management's attitude" toward negotiation. The union is unhappy with the airline's plans to change cabin crew conditions. Unite says working hours will be extended and crew levels will be cut, changes that will damage customer service and hit the British Airways brand. The airline says the changes will save the carrier $665 million. BA has been losing hundreds of millions of dollars each quarter this year. Cabin crew staff voted overwhelmingly in favor of the strike. But the airline argued in court that some of the workers who cast ballots had already taken voluntary redundancy -- or buyouts -- from the airline. Some 10,288 workers voted, of about 14,000 cabin crew staff overall. The airline's legal counsel, Bruce Carr, told the presiding judge that the balloting process contained "serious and substantial irregularities." Carr called the union's action in choosing to strike over Christmas "willfully disproportionate and clearly unlawful." He referred several times to the serious disruption that would be felt by the airline's passengers, saying some "ordinary people will find it very difficult to understand." Simpson said management imposed terms on the union members without agreement, and when Unite asked a court to stop it, the court did not. The fact that the court has now blocked the union from striking "shows an imbalance in employment law," he said. Travel experts have said around 1 million British Airways passengers could have been affected by the strike, finding themselves stranded and unable to rebook their tickets during the busy travel period. Thursday brought disruption to thousands of passengers on another airline, one run by the small Scottish charter company Globespan. The company announced on its Web site that it has gone into administration and that all flights on its airline, Flyglobespan, have been canceled. Further travel headaches are in store for passengers of other airlines at Heathrow and Aberdeen airports next week. Unite said baggage handlers and check-in staff at the two airports plan a series of three separate walkouts starting next week in a dispute over pay and pensions. The strike is not related to the British Airways dispute. The baggage handlers and check-in staff are employed by SAS Ground Services UK Ltd. The strike will affect travelers on Turkish, Emirates and Thai airlines at Heathrow and passengers on KLM, Air France, Wideroe and Atlantic at Aberdeen, Unite said. The walkouts are scheduled for December 22-24, December 26-27 and January 3-4. Those passengers hoping to avoid air travel in Europe and take the train instead faced uncertainty after British-based drivers of the Eurostar train announced a series of two strikes starting this weekend. The drivers said they will strike Friday and Saturday, and again December 26 and 27. Eurostar, however, said service would not be affected, because drivers from France and Belgium would be used. The train line provides service between London and both Paris, France, and Brussels, Belgium. The union representing the drivers, the Associated Society of Locomotive Engineers and Firemen, said talks with Eurostar "concerning international allowances" broke down. The dispute is over how much drivers' meal allowances should be when they are in Paris and Brussels. A Eurostar spokeswoman said it offered the drivers what it believes is a reasonable amount, but the drivers rejected the offer. She would not divulge specifics of the offer, saying only that it was "enough for a good meal." --CNN Business Correspondent Jim Boulden contributed to this report.